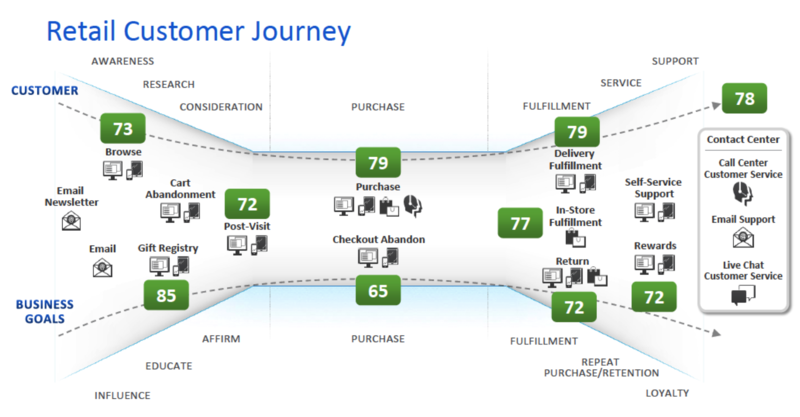 The Customer Journey in a multi-channel world is comprised of a variety of factors that need to be considered, understood and addressed if an organization is going to be successful in holding on to and growing their customer base. Digital adoption for interacting, shopping, learning and seeking information and opinion continues to explode across all demographical segments. Its not just the millenials anymore. It is now common to see an older adult acclimated to checking out product information, seeking directions or gathering information about current news via their mobile device. Because their children, grandchildren, friends and co-workers have adopted digital as their preferred method to stay in touch, seek information, collaborate and more. The simple “if you cant beat them, join them” or “what do they know that I don’t, let me find out” challenge acceptance. The demographical chasm we have all talked about for years has begun to close. Are you ready for the multi-channel customer? The multi-channel customer journey can be defined as the ways and paths a customer moves across, within and hierarchically through all of the potential interaction and service points (think phone, in person, online and mobile) and multiplied further if you have more than one product or service and multiplied even further if you have silos within your organization. All organizations must provide their customers, members, subscribers or constituents with high quality and useful services across all channels, as this is not only what they want but also now demand. As a result, all organizations: for-profit, non-profit, government and NGOs need to move quickly to be customer focused especially if they are in a highly competitive market. Being customer focused requires as much urgency as being “digital”. No longer does moving forward simply mean buying the newest digital platform or customer relationship management system, redesigning a store or building a new website, although that might help you move forward on the path. The most important action item, next step and priority is gaining customer focused knowledge. The collection of knowledge is a complete and thorough understanding of the organization’s multi-channel customer journey that recognizes human behavior and how experience drives satisfaction and grows brand equity. The knowledge can create insight and intelligence about customer behaviors and actions which are critically important to your brand and growing your revenue. Why Experiences and Behavior Matter? We are all products of our experiences, a concept I have often talked about in client meetings, in conference sessions or via this blog. Our collective experiences result in the filters that we apply to our World and are colored by our “baggage”. The “baggage” comprises the influence of those directly or indirectly around us, our own personalities and preferences, our cultural definitions and our level of acceptance. Your goal should be to account for each of these factors in your marketing, service, design and ultimately throughout your multi-channel customer journey. It is important that any plan and strategy attempt to address each one holistically and individually. Cognitive Experience comprises thinking. Yes we all think or at least I hope we do. Although my experiences driving around the DC Beltway at times has me “thinking” otherwise. Our prior experiences create expectations and filters for an experience we are having or are about to have. The brain takes in the experience and provides us checks, filters, and opinions on what we “think”. An organization doesn’t control what someone thinks and can’t know the sums of prior experiences the customer has had to flavor the “thinking” about the experience. An organization can however take a step back and objectively look at their customer journeys and determine completeness, appropriate function and quality to accommodate the “thinking” customer. It is also important not to make your customer “think” they are stupid. Some companies do this so well. We will see how long they actually last. Affective Experience is about “feeling”. How do customers feel about your services, your offerings and your brand? Like thinking, we also all “feel”. Feelings obviously can be positive or negative, happy or sad, angry or ambivalent. Our feelings are also colored by our world and prior experiences. Your services, your brand and your products create feelings in individuals. Like with thinking, an organization needs to step back and objectively look at the design, color choices, service levels and overall products to determine what “feeling” is desired and how customers are actually “feeling” when interacting across the journey. Physical Experience (Act) is the physical interaction and experience we are created in a physical store, office or location. A physical experience can also represent digital and mobile. A digital or mobile interaction occurs via a device but where the customer is and in what environment have they chosen to interact with you? That environment can impact similarly to a store experience but is one where you have less control. Sensory Experience (sensing) is tactile and sense oriented. Sense like the “act” in the physical experience can mean more than a sensing in a physical store or location. How are you impacting your customers’ senses? 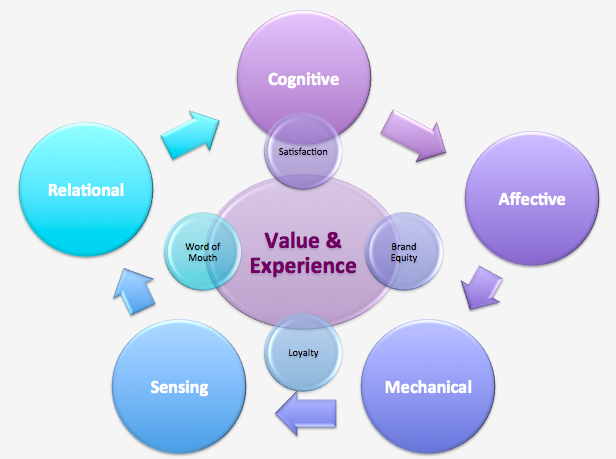 The environment surrounding a digital experience can equally promote or create a “sensing” experience. A sensory experience is strongly connected and creates a “feeling” which really is a result of the brain “thinking”. A thought leads to another “feeling” of “relating” which causes an “act” (purchase). Relational Experience (Relate) speaks to how a customer aligns or “relates” to your products, your services and your brand. Are you creating a connection with your customers that promote their loyalty? Do they “feel” and “sense” that you meet their needs and really “relate” to them and their lives? Wait there is more? Um Yes. Lastly, the mechanics and function (operations, performance) of the services or products stimulates customer opinions and acts as a catalyst creating input into the overall perception and beliefs held about the organization’s experiences. So we have done a lot of thinking, feeling, acting, sensing and relating but how does it impact your organization? 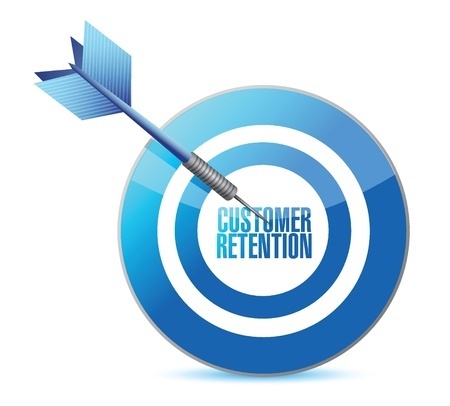 Satisfaction (or lack thereof) of your organization, your services, your products and ultimately the multi-channel journey you offer to move customers to become loyal fans and purchasers. Word of Mouth (negative or positive) results directly from positive or negative opinion (satisfaction) about your organization, your services, your products and your journey. Those happy or angry customers talk with their friends, their relatives and in their social circles. 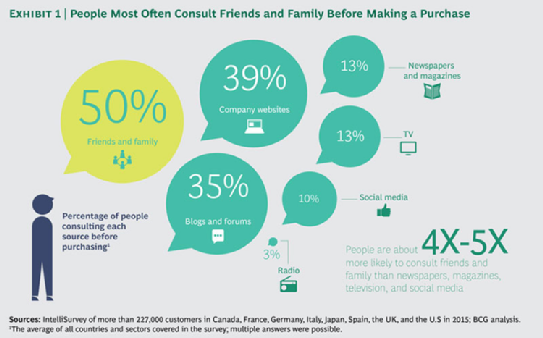 The Boston Consulting Group recently released a survey demonstrating that over 50% of people consult those around them before making a purchase or commitment. Brand Equity (perceptions and beliefs) here is really where all of that “thinking”, “feeling” and “sensing” can have a short and long term impact on your organization. 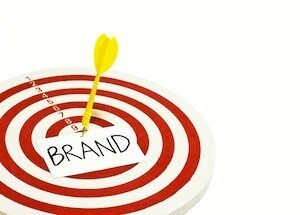 Your brand equity is controlled by your customers and their perceptions and beliefs about you and what you offer. Loyalty (commitment and allegiance to brand and business) when you are offering high quality customer journeys and receiving good word of mouth which results in satisfied customers you will receive and gain customer loyalty. Loyalty is most closely aligned with the relational experience where customer’s want to relate to you, want to think and feel you are good and produce good products and services and sense that they can maintain trust and respect. Loyalty also results from the “feeling” and “sensing” of a physical store or location. The answer is taking a systems thinking approach of looking outside in with an objective view of the organization’s multi-channel journey. 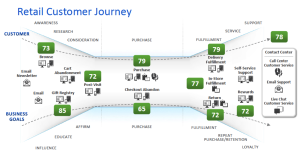 Map the journey to understand truly how customers are moving across, within and hierarchically through your channels that comprise the journey (all products, service points and types). Gather as much data as possible about customers including socio-economic, location, cultural preferences and the like, derive insights and intelligence from the data. Study the analytic reports and views available and match or incorporate the acquired or gathered external data. Collect sentiment feedback to determine how you are meeting the variety of factors comprising experience. The move to customer focused and digital is challenging and complex but truly a necessity in today’s hyper-digital and device driven world. One must account for the human condition and how behaviors, thoughts, and feelings translate to satisfaction, equity and loyalty. Prioritizing the gain in knowledge and putting that knowledge into practice is how you maintain and grow your organization and increase customer satisfaction. To learn more, please watch my Digital Analytics Symposium Keynote: Multi-Channel Analysis video on YouTube. Of course, we are here to help. You may not realize you need us, but you do. The 2040 Digital team are experts in this realm and can steer you through the complexity. Give us a call or drop us a note via our contact form.